Photograph Description: Congressional leaders leaving the White House Tuesday after a conference with President Roosevelt following his return from Hyde Park. Left to right: House Majority leader Sam Rayburn, Senate Majority Leader Alvin W. Barkley, Vice President Garner, and Speaker William B. Bankhead, 6 Published: 1938 June 1. Subjects: United States--District of Columbia--Washington (D.C.). Historic Photograph of Congressional leaders leaving the White House Tuesday after a conference with President Roosevelt following his return from Hyde Park. 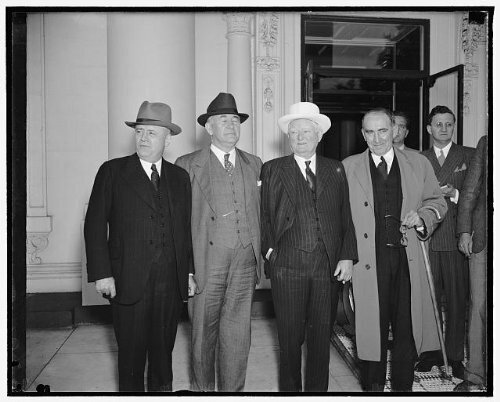 Left to right: House Majority leader Sam Rayburn, Senate Majority Leader Alvin W. Barkley, Vice President Garner, and Speaker William B. Bankhead, 6 Published: 1938 June 1. Subjects: United States--District of Columbia--Washington (D.C.).